We are the Mandi District branch of Indian Red Cross Society. We are raising funds for the treatment of one Naresh Kumar s/o Sita Ram, village Burahali, PO Ghagnu, Tehsil Balh, Mandi, Himachal Pradesh. Naresh Kumar is a 24 year old rural youth who has a dependent widowed mother. He used to earn his honest living by driving a truck and he got severely injured in both legs in a road accident in Pinjore on 22.07.2017. His treatment was ongoing in PGI Chandigarh but the widowed mother, his sole family member, is no longer able to afford the treatment costs. The mother works as a MGNREGA labour to earn and support them. Naresh Kumar is bed-ridden at a very young age and not able to move around. Our team visited the house of Naresh Kumar and found the family to be in poor condition since the sole breadwinner of the family is incapacitated and in need of medical treatment. In absence of financial support, the family is likely to slip into abject poverty. 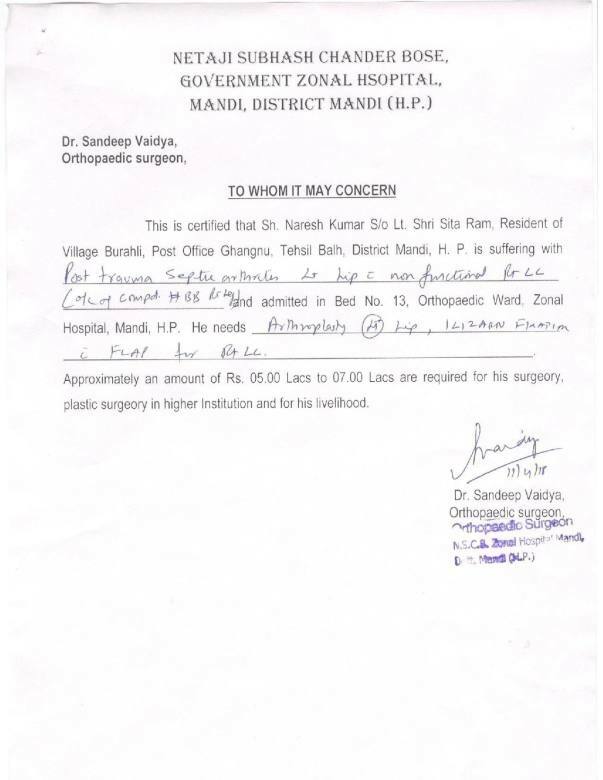 With our campaign we intend to raise funds which will be spent towards the further medical treatment of Naresh Kumar through the Indian Red Cross Society. We appeal to all donors to come forward, lend a helping hand to this family and help in changing the life of this rural youth for the better. This was the first crowd funding campaign run by District Red Cross Society Mandi for a noble cause. We thank all the donors for their generous support. The funds raised by the campaign will be used for the treatment of Mr. Naresh Kumar post amputation of his leg. Our aim is to get him an artificial limb so that he can then stand on his feet and live a respectable life. 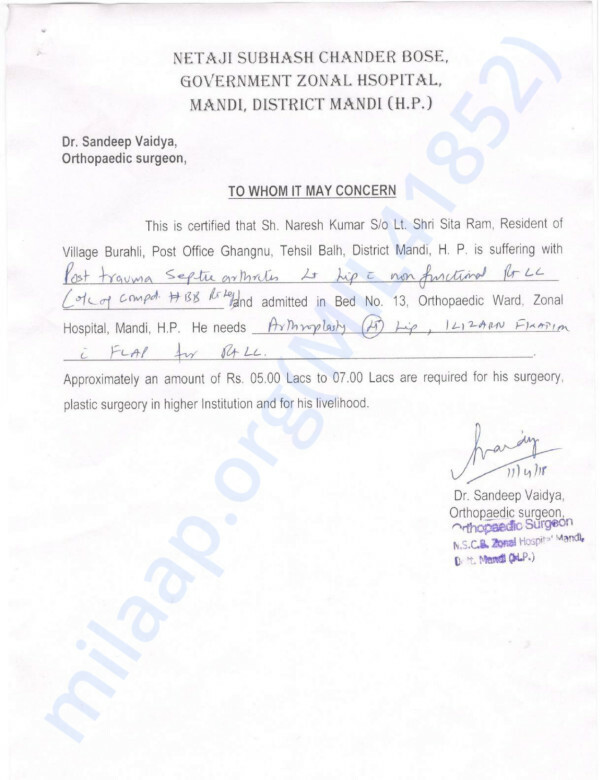 Due to seriousness of injury, Naresh Kumar's leg had to be amputated at the Zonal Hospital, Mandi. The family consisting of Naresh Kumar and his widowed mother needs more generous support to tide over this unfortunate circumstance. We appeal to all donors to donate with open heart. 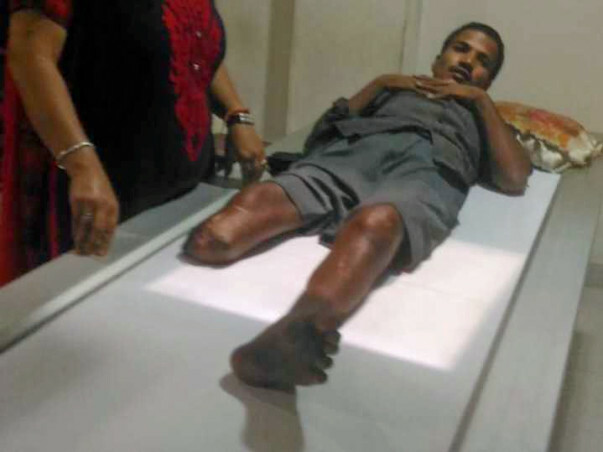 The money would go towards further treatment of Naresh Kumar including getting him an artificial limb.